The Sermon on the Mount, found in the Gospel of Matthew, is not difficult to understand. The challenge is doing what it says. Yet Jesus summons us to follow him as his disciples living the kingdom life he teaches us, so that through such living the future goal (telos) of history begins erupting upon the present. Thus Jesus presses us as his disciples to pursue a righteousness that exceeds that of the Pharisees and the teachers of the law (cf. Matt 5:20). It’s not enough to love our families, neighbors, and God. We must also love our enemies and pray for those who persecute us. This is what distinguishes us from every terrorist, murderous, war-mongorous, individual who is quite willing to love his or her family, friends, and neighbors of good standing but is more than willing to do harm and even kill those he or she regards as an enemy. 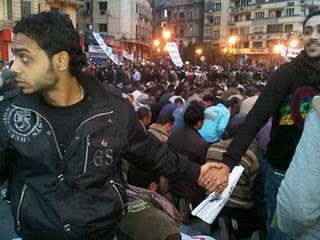 The picture in this post is a shot of Christians in Egypt surrounding Muslims gathered for prayer as a means of protection during the Egyptian revolution of 2011. I post it as a reminder to us all that it is possible to love our enemies. In the message posted below, which I preached before the Columbia Church of Christ on Sunday, June 30, 2013, I challenged the church to hear this instruction of Jesus. I wanted the church to wrestle with the challenge of this text (or better yet, let God wrestle with our hearts) rather than to resolve it in a way that fits with our American way of life. However, as with any message, a preacher can only do so much in one time-slot. So I want to go a bit further here and address one of the major ethical questions this passage raises which is the question of killing and warfare. Namely, is it ever appropriate for a Christian to participate in killing an enemy or engaging in warfare against that enemy? Throughout Christian history there have been two answers to this question. Yes and no. Those who answer the question in the affirmative fall into the “Just War” tradition while those who say “no” to the question fall into the tradition of “Christian Pacifism.” There are credible arguments for both traditions, so neither view should be dismissed as unrealistic or indefensible. Having said that, rather than argue for either tradition I want to offer a challenge to each tradition in the way it responds to Jesus’ challenging instruction. As I said, for some Christians, it is believed that there is are certain times when engaging in warfare and killing is necessary to stop a greater evil from advancing. This is regarded as just war. If you click on the Wikipedia link for Just War Theory you can read a synopsis of how this doctrine developed and the classical criterions for discerning what is a just war. Those who embrace the doctrine of just war need to take it seriously. The entire premise of a just war assumes that there is also an unjust war. If the said action of a war is incompatible with the Christian criterion for what constitutes a just war, then the war is unjust. For example, warfare which knowingly targets non-combatants such as civilians is unjust. Christians who adhere to the doctrine of just war must learn how to discern when war is just and unjust, resolving not to participate in any unjust war. For Christians to participate in any unjust action is to engage in injustice and fail to have a righteousness that surpasses that of the Pharisees and scribes. For other Christians, it is believed that Jesus’ call to love our enemies is defined by the way Jesus loved his enemies, suffering their persecution rather than killing them or engaging in warfare against them. For these Christians, there is no such thing as a just war for Christians to engage in since as far as it is known the historical Jesus of Nazareth never killed any of his enemies or engaged in warfare against them—even though he had plenty of opportunity to do so. If you click on the Wikipedia link for Christian Pacifism you can read a synopsis of this doctrine. Those who embrace the view of Christian pacifism need to remember that pacifism does not equate with passivism. While, as far as it is known, Jesus never killed or waged war against his enemies, Jesus was never passive in wake of oppression and evil. Jesus pursued his kingdom ministry in the trenches with people who were suffering, including those who suffered under the oppressive and evil tyranny of others. Not only did Jesus live in the trenches with such people, Jesus was willing and in fact did lay his own life down for those suffering. Christians pacifists must be willing to do the same as Jesus. To do any less might be regarded as pacifism but it won’t be Christian pacifism. Whether we hold the view of Christian pacifism or just war, the challenge to love our enemies and pray for those who would persecute us is the challenge to see our enemies as people. All humans have been created in the image of God. Therefore in every human do we see the image of God and our own image since we too bear the image of God. When we learn to see our enemies as God’s creation who bear God’s image, it ought to become very difficult to treat them as an enemy. For we too were once enemies of God who loved us still. And when we learn to love even our enemies, the world will see a snapshot of what life is like when God is given reign. This entry was posted in Christian History, Columbia Church of Christ, Kingdom of God, Preaching and Teaching, Scripture. Bookmark the permalink. But I say unto you, love your enemies,…. That is, as the Apostle Paul may be thought to interpret the words of Christ, Romans 12:20 . “If thine enemy hunger, feed him: if he thirst, give him drink”: unless our Lord should be supposed rather to regard the internal affection of the mind; since outward expressions of love, by words and works, are urged in the following exhortations: the actions of a man may be hated, and just indignation be expressed against them, and yet his person be loved, tenderness be used to him, and pity shown him: all men, even enemies, are to be loved with a natural love, as men; though they cannot be loved with a spiritual affection, as brethren in Christ: and in natural affection there are degrees, according to the relation and circumstances that persons stand in to one another.